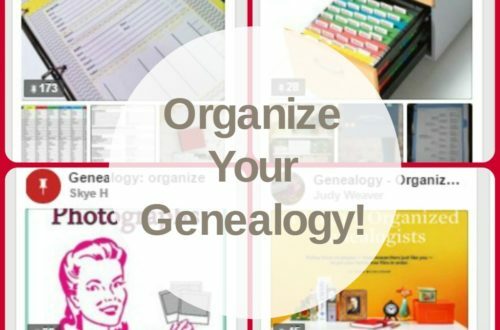 Organize Your Genealogy Using a Timeline | Are You My Cousin? 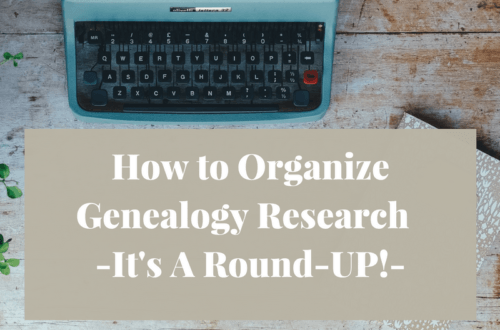 This month we are focusing on organizing our genealogy research. Genealogy organization includes more than just organizing your physical files. 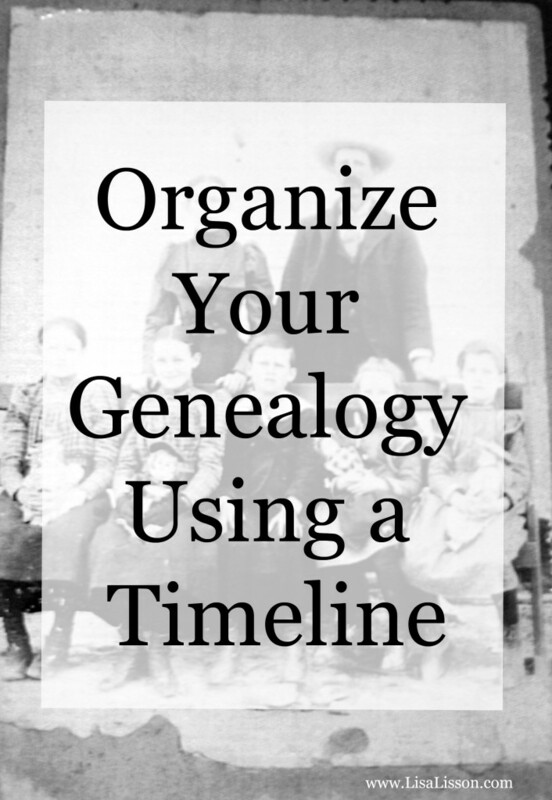 It can and should include organizing the events of your ancestors’ lives. Timelines allow you to put your ancestor in chronological time and place to better understand his/her movements and connections. Timelines reveal gaps in your research where more information about your ancestor is needed. Simply by creating your ancestor’s timeline, you become very familiar with him/her and can possibly anticipate where to find more sources of information. My favorite two tools to use when creating a timeline for an ancestor are paper and pencil. That’s right….just paper (notebook paper is fine for me!) and a preferably a mechanical pencil. Add in colored pencils and that’s a bonus! More high-tech options are certainly out there. Check your family tree software for a timeline option. This can be a simple way to create your ancestor’s timeline. Online resources are out there, too. Some are free and some are subscription based. 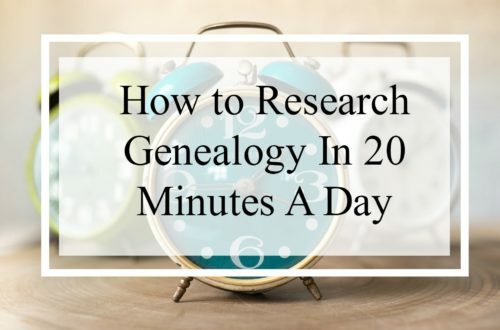 I have not personally used any, but have seen Timetoast and Our Timelines as options other genealogists use. One thing you will want is a good historical timeline. 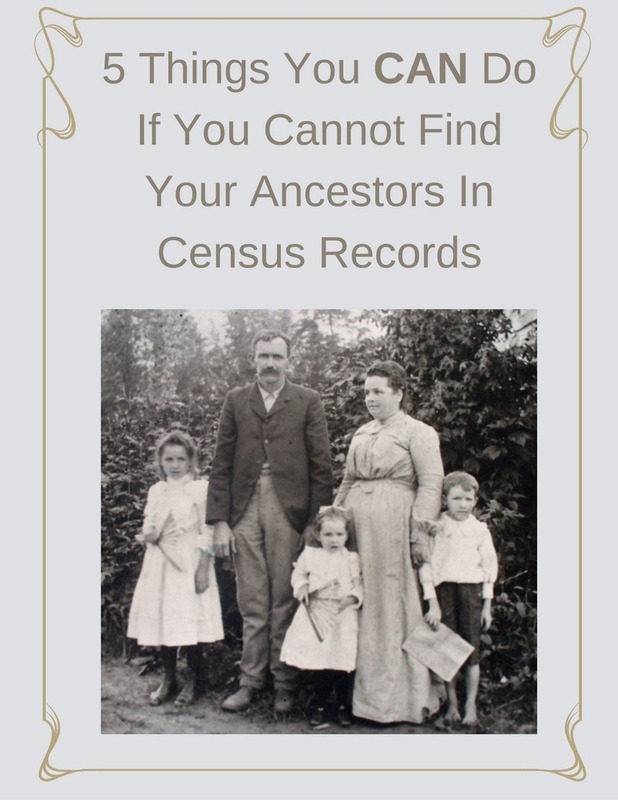 Placing your ancestor among national, state and/or local events can reveal important clues about your ancestor and places to search for new records. Online tools will often have this feature built in. The Animated Atlas of American History is one of my favorites. For state and local events timelines, I simply perform an internet search for “Timeline of [Location] history”. 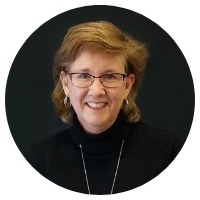 Performing an internet search for “Timeline of North Carolina History” resulted in timelines for different centuries, timelines on women’s history, and timelines on healthcare/epidemics. If you have ancestors in North Carolina, any of these events could have had an impact on there lives. Timelines can take on many different forms. Let’s look at a few examples before you begin. 1. 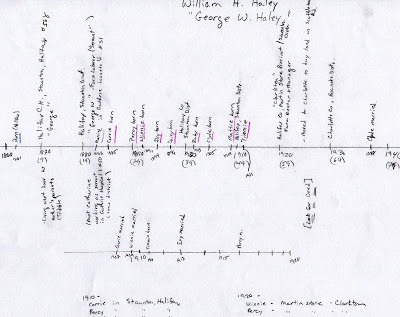 This is a paper and pencil timeline for William Haley (1861-1948) of Charlotte County, VA. This one is simple, quick and requires no learning curve. 2. 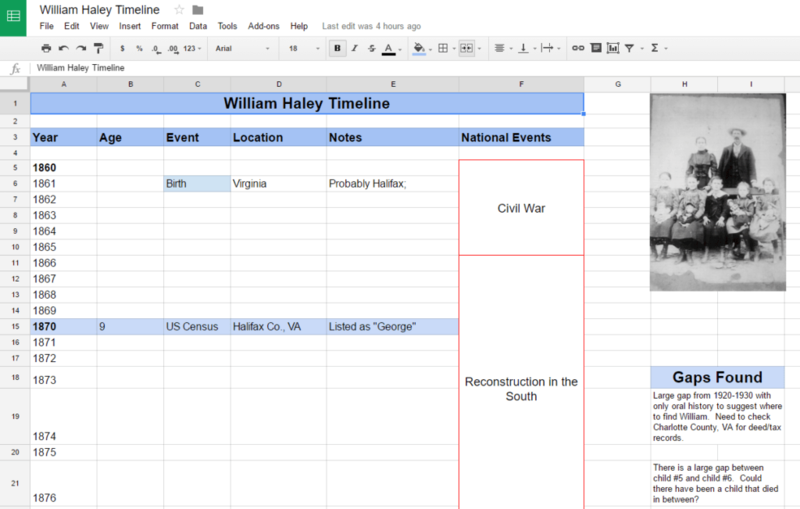 This is an example of a vertical timeline for William Haley created using Google Sheets in Google Drive. You can use MS Excel to achieve the same thing. View the whole timeline here. 3. 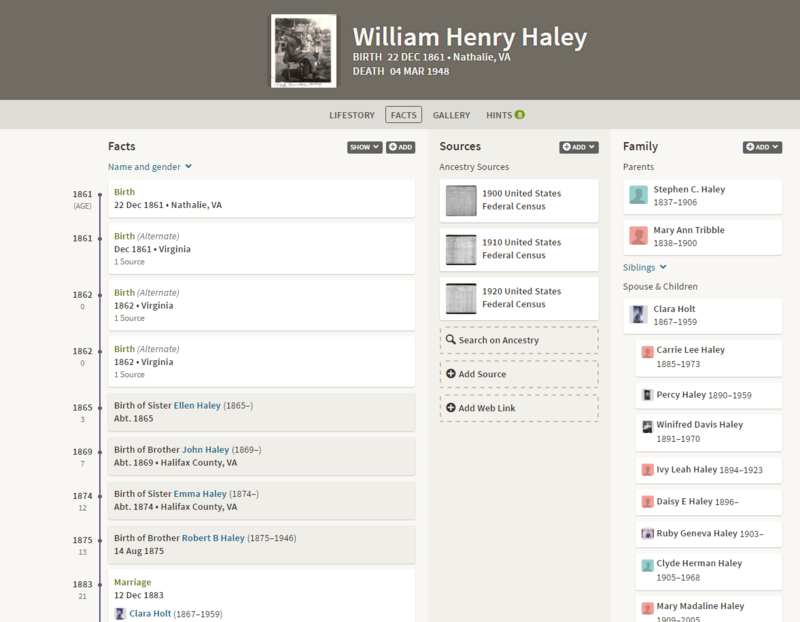 This is an example of a portion of William Haley’s timeline from a genealogy website. Ancestry.com displays an individual’s profile in a timeline format. 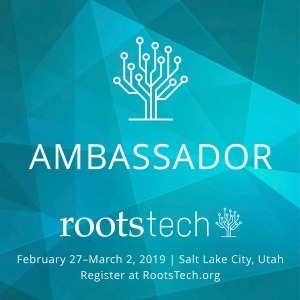 While this style by Ancestry.com has not always received favorable reviews, there are advantages to it. Check the program you use for your family tree for instructions on creating a timeline. 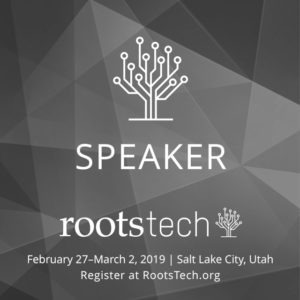 In the past, I have used FamilyTreeMaker and RootsMagic to easily create timelines as well. There is no right or wrong here. Try different formats and find which works best for you. The best timeline is one that you will actually use! Grab those physical and digital files that you have already organized and readily accessible. Decide which historical timelines to use for reference. Decide the format of your timeline. How did your timeline turn out? Share yours in the Facebook Group! This blog post is spot on. 🙂 I homeschooled my children, and we used timelines for years to get a better view of what was going on in the world at the same times. I added my husband and myself, and our parents and grandparents, to the timelines to give my kids a realistic view of when their ancestors lived. I look forward to doing the same with my grandchildren-yet-to-be one day. Great- am a long time genalogist but am anxious to do some time lines. Enjoy those timelines! I’m sure you will find them helpful! Thanks so much for including my timeline example! Hi, I wish you would use darker print. It’s very difficult to read and I really enjoy your posts. I just took a look at your William Haley timeline on Google sheets and I want to try it. Do you have the template available so that we can copy it? I’d love to have the formatting already in place! No problem, Kim! Click here to a copy. Once there, click “file” and then “make copy” and you are good to go. Thank you for the Timeline template. It is easy to use and just what I needed. I can’t wait to get started! You are most welcomed. Enjoy! That’s another great site, too.